41 Bridge Street welcomes back Anthony Gomes to our stage on Thursday, April 11 at 8 PM! Anthony Gomes is a familiar face to anyone following the modern blues scene. He has been carving out his own space as an unapologetically rock-influenced bluesman and songwriter since first coming to national attention in the late 1990s. Gomes’ new record, Peace, Love & Loud Guitars, is the culmination of a life spent honoring blues traditions while never losing sight of his own identity. He is that rare artist able to take the Zen simplicity of blues music, fuse it with the rush of rock and roll, and write memorable new songs that exist somewhere between creative geniuses Willie Dixon and Billy Gibbons. He stands his ground as a creative artist, not a derivative history lesson, and is eager to push the blues back into the mainstream. Originally from Toronto, Canada, Gomes has taken his blues to 17 countries and performed with luminaries like B.B. King, Buddy Guy, Robert Plant, Heart, Sammy Hagar, Joe Bonamassa, .38 Special, Jonny Lang, Robert Cray, and Kenny Wayne Shepherd. His high-level guitar, vocal, and songwriting skills have made him one of the top drawing artists in the blues/rock world. His 2015 release Electric Field Holler, debuted at Number Three on the Billboard Blues Chart and he has had five records make the Top Ten there, including 2008’s Live, which debuted at Number One. His song “Love Sweet Love” has racked up over 3.5 million plays on Spotify and was selected by Relix Magazine from more than 40,000 submissions to its song competition for its CD sampler. Clearly, the world is listening. Not content to only contribute to the blues as a musician, Gomes is also an award-winning scholar of blues history. He earned the University of Toronto’s C.P. Stacey Prize for the highest overall GPA by a history student, completed his Master’s Degree thesis on the racial and cultural evolution of blues music, and graduated with high distinction. His thesis, The Black and White of Blues, was published in 2014 and was nominated for Best Blues Book of the Year by Blues 411. Gomes is socially active as well, creating the Music Is the Medicine Foundation in 2010 to bring the healing power of music to those who need it. MITM directly assists children with cancer, military veterans with PTSD, and young adults with autism. The Foundation has been awarded grants from State Farm Insurance and CVS Pharmacy and used them to fund songwriting scholarships, donate instruments, and provide music education programs. Gomes believes music is an essential part of the human experience and isn’t afraid to get his hands dirty bringing it to people who could most benefit from its presence in their lives. 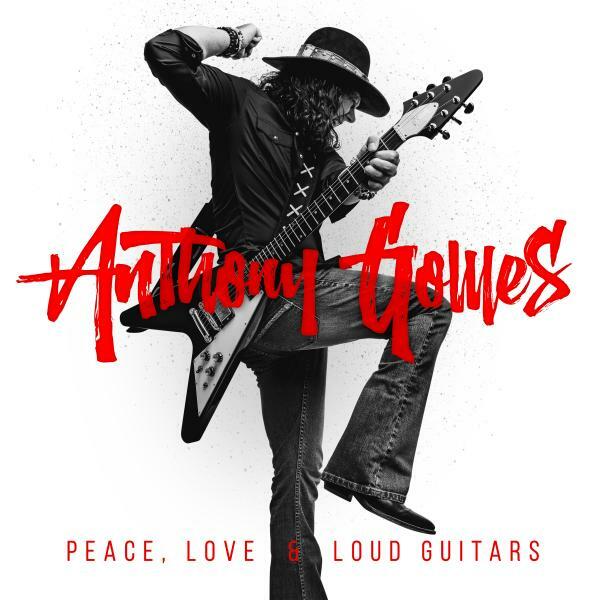 Peace, Love, & Loud Guitars is a pivotal release for Anthony Gomes. He is a true believer in the game he plays and the power it contains. He knows he can rock the roadhouse and be smart and relevant at the same time. Now is his time to take the biggest stages of his career and finish the climb he started long ago. Looking for an actual 21st Century guitar hero? Here he is. Tickets to see Anthony Gomes at Bridge Street Live are $20 for General Admission and $30 for VIP Reserved Seating (plus fees).